Who doesn't love a wonderful Fried Chicken Recipe? Everyone I know loves it. This is the Fried Chicken I have served for many years. It is virtually foolproof. It is simple, reliable AND delicious. But there is a secret or two you need to know if you want your fried chicken to be "perfect." This Fried Chicken Recipe holds a special place in my memory of a wonderful time when I was just a little girl. It is truly an American comfort food. Long before I was grown up, long before I had my own family; long before I was a restaurant owner; fried chicken was the heart and soul of many Sunday family dinners and often the center of the plate on other special days. This chicken recipe is the way my mother, and her mother before her, cooked fried chicken. I "stole" the recipe when I began cooking for my family and I used it again when I went into the restaurant business. And since the restaurant customers rave about their fried chicken and order it frequently, I use this basic recipe to this day. 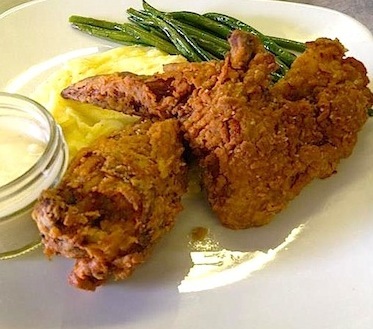 Fried chicken can be a very contentious subject in America, among cooks anyway. Every region in America has their own way of preparing it - and, of course, their way must be the best way. Through the years there have been many attempts to improve upon this basic recipe. Today there are hundreds of recipes for so-called southern fried chicken and thousands for fried chicken in general. The chicken recipes vary from the seasonings used to the coating or batter (if any) to the fat and to the cooking time and cooking method. Some recipes will instruct (insist) you remove the skin before flouring or battering. Other chicken recipes require double-coating or battering the chicken. Some recipes fry in oil, some in butter, and others in bacon grease or they add bacon grease to the oil before frying the chicken. So there are numerous variations on this basic fried chicken recipe, and I have tried and used many myself. But this recipe seems to please everyone's taste buds. Southerners are the first to declare their fried chicken recipe as being the best, but Southerners weren't the first to fry their chickens. The Scottish people who settled the early South apparently introduced fried chicken in the United States. They liked their chicken fried rather than boiled or baked as was normal for the English in the Northern states. Give credit to people in the South for popularizing fried chicken because it wasn't until the early 1900s that recipes for fried chicken began appearing in Northern cookbooks. A basic fried chicken recipe is very simple: the chickens are cut up, dredged in (seasoned) flour, put in a skillet with hot fat, and fried until golden brown. And, as I mentioned, all the other variations are attempts to improve upon this basic but delicious method of frying chicken. From all the reading I have done and from all my experience, one of the "secrets" to delicious fried chicken is using a seasoned cast iron skillet. The other "secret" is to use small, tender, lean chickens and I'll add this: buy organic (naturally grown) chickens if you can. Since the chicken will be fried with only the simplest of seasoning, the chickens' quality and freshness are very important. Finally, do NOT add MSG or other flavor enhancers to your cooking. I have seen a number of fried chicken recipes calling for this addition. MSG is not good for you and your family and many people are highly allergic to it. Preparation time: 15 minutes. Serves 4-6. Here is one simple option you may want to try: dip the chicken in buttermilk, shake off the excess and then flour the chicken. This creates a slightly different flavor but also a delicious fried chicken dinner. And when I'm feeling particularly adventurous, I will add some Tabasco sauce to the buttermilk for a spicier taste! What to serve with your delicious fried chicken? Mashed potatoes and gravy (in some areas - rice), fresh green beans or corn-on-the cob with dinner rolls. Or potato salad and barbecued baked beans with biscuits! Enjoy your simple, reliable, delicious Fried Chicken Recipe for many, many years to come and the company of those you share it with! Did you know? The number of KFC outlets have declined in the US, but the company has continued to grow in Asia, South America and Africa. The chain has expanded to 18,875 outlets across 118 countries and territories, with 4,563 outlets in China alone, KFC's largest market.